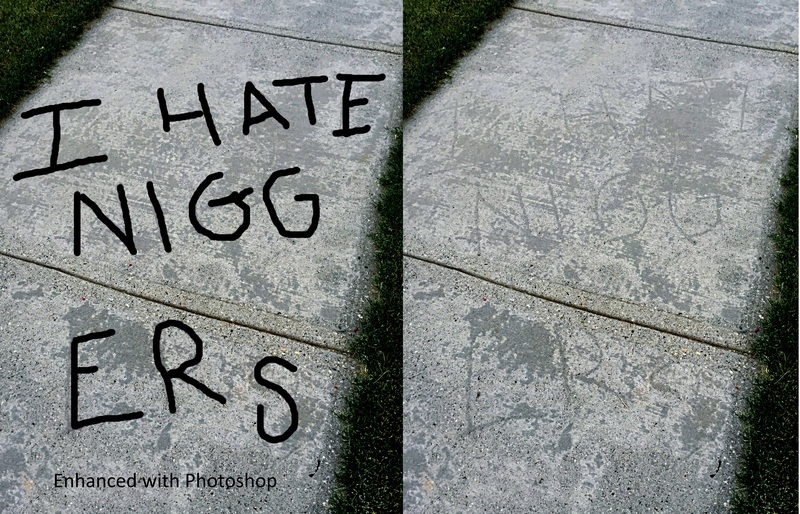 A few weeks ago, I was out walking my dog in Chartwell, my Johns Creek subdivision, when I came across the words, “I hate N-word” etched into the sidewalk. It wasn’t painted on. It was scratched on. I hope that I don’t have to convince you how horrible this is. Can you feel the hurt this sidewalk could cause to the few African-Americans living here? And I truly hope the appearance of this graffiti is not related to my new African-American neighbors who just moved in! We have lived in Johns Creek, Georgia longer than there has been a Johns Creek, Georgia. We even lived here before Johns Creek was named the wealthiest city in the state of Georgia where the average income is in the six digits. We have great public schools (if – don’t tell anyone – you can’t afford to send your child to the private ones), almost no crime, and we want for nothing. Our garages are nicer and larger than the average homes in third world countries. I was once proud of this. It matters little to me now. It is not what is important. It is never going to make anyone truly happy. My husband and I were barely in our thirties when we bought our house – all six thousand square feet of finished floor space – in the “highly desirable” Chartwell subdivision. Six bedrooms and five baths. Even with a live-in nanny, we had two spare rooms. My husband was a business consultant and I was working my way to the executive suite managing technology companies. We thought this extravagant lifestyle was what we were supposed to do. Living the American dream. We thought we had earned it. And truth be told, we raised two amazing sons here. I am grateful for many things that living here provided. But I have a far better understanding now of what is important, lasting, and meaningful. There is one thing about living in this sort of opulence that you have to understand. There is a high value placed on “keeping the peace.” Good, smart, upwardly mobile people know how to keep the peace. Otherwise no one likes you. No one invites you to their parities. No one networks with you. No one talks to you when you walk your dog. Yet, that kind of peace isn’t real. Real peace – what the ancient Jews call shalom – is a wholeness that encompasses everyone – not just one’s self or one’s family or even one’s neighborhood, but everyone. Shalom is not obtained until every living thing experiences it. Often “keeping the peace” is the opposite of shalom. Temporary and even hurtful. So today I am going to break all the rules about “keeping the peace” and work for Shalom instead. There can be no shalom in this neighborhood or city as long as we are okay with this sidewalk being there! I am not okay with it. Not for a day. Not for a week. It’s a hate crime for it to have been written. And it is an even bigger hate crime to let it sit there. So I posted the picture I took of the graffiti on the neighborhood chat board. Within minutes, I had a note from a board member saying I was going to stir up trouble scolding me to take these sort of matters to the board first. Maybe he had a point – after all, we need to “keep the peace.” He is a good person so I complied and took the picture down. I heard from several board members who assured me the sidewalk would be fixed. It is weeks later now. It has not been fixed. I’ve talked to multiple board members and I cannot even get a date from the city as to when it will be fixed. I can get no details as to what the issue is. Just a “we are all doing our best.” And to let them handle it. This situation is made even worse because in the last few weeks, the city has been tearing out sidewalks throughout the neighborhood and repairing them. 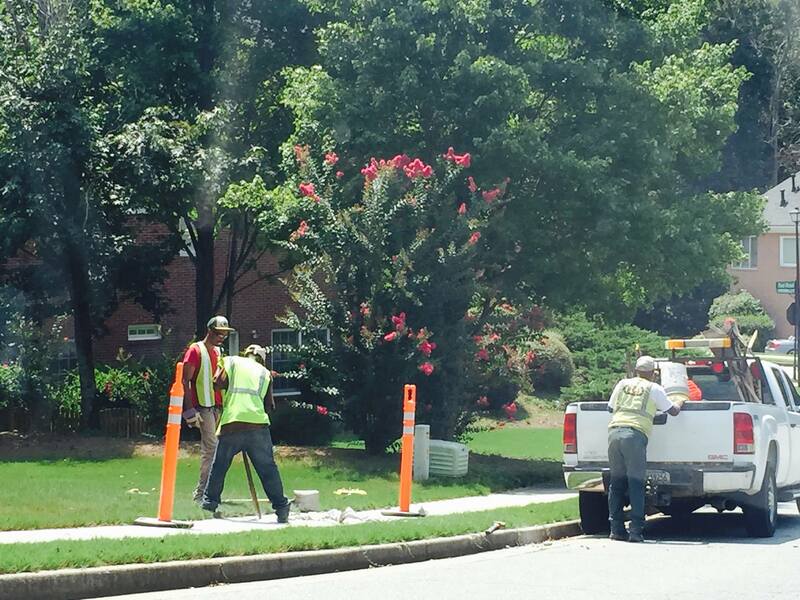 In fact, they tore out sidewalks within feet of the “I hate n-word” sidewalk! But didn’t remove the highly offensive squares. Is this intentional? I hope not. Okay Chartwell board and/or City of Johns Creek . . . I have paid more than $17,000 in neighborhood dues and $100,000 in taxes! I wish I had made better choices and that money had gone to feeding the homeless or taking care of immigrants. But here we are. I have never asked you for one single thing in the twenty years that I have lived here. I have never complained about one single thing in the twenty years I have lived here. Please fix the dang sidewalk! Stop all the nonsense and just do it. I challenge you to never settle for “keeping the peace” and instead seek to create real shalom. Is it easy? Not ever!! Am I going to get beat up – probably not physically, but I don’t imagine my Great Dane and I will get as many friendly waves during our morning walks. That will make me truly sad, because it is fun to be carefree and loved. But I can live with being disliked if that is how it must be. What I can’t live with is a sidewalk that hurts even one person. Update: Thank you to all the people who joined me in contacting the city on Friday. More than 80 of you had shared this blog by noon. The sidewalk was fixed by the end of the day. Below was an email from the city manager, who was extremely helpful. The Chartwell board, two members in particular sent me ugly emails calling me crazy and irresponsible, and signing one email by wishing me Shalom. This after I had pleaded with them to take action for several weeks, offering to make the calls and visit the city myself, and giving them notice a week ago that I would be forced to take action if we couldn’t even get a date — a date for it to be fixed, not even fixed — by Friday. On the other hand, I had nothing but supportive emails from other homeowners and the city itself. I haven’t gone myself to check yet but I know our crew was directed to pull out that section of sidewalk and replace it. I will go by either tonight or tomorrow morning to confirm that the work has been completed properly. The Police did investigate and the new homeowner at that address told our Detective that he was power washing the sidewalk recently and knocked off the grout and light cement covering and uncovered the racist graffiti. Apparently it had been written a while back and the County had done a poor job of repairing it to make sure the writing was removed. So, it seems that this hideous act was committed a long while back and we are unable to investigate. I’m glad it appears that we don’t have a new problem. I will back check to be certain the work has been completed and I’m sorry for the delay in getting this done. I’m still reviewing what caused the delay but it appears to me that the issue was called in and a work order issued that took a few days to get to. It should have been treated as an emergency and removed immediately. We will enhance our training on how to handle these problems. I’m sorry for all the delay on our side. It’s unacceptable. I hope our quick work now to rectify this will be satisfactory to our citizens and bring peace to the neighborhood. If I can be of further service don’t hesitate to contact me. Men fixing the sidewalk. Does it seem notable to you that the crew is African-American? I’d comment on this, but it is worthy of more space than I’ve got. Coincidentally, Dr. April Love-Fordham is the author of James in the Suburbs: A Disorderly Parable of the Epistle of James, which asks the question if one can truly be a follower of Jesus living the wealthy suburban lifestyle. Update: I have a note from the city manager saying this is the first he had heard of it. He is going to send a crew out to fix it this morning. I also got notes from people saying they were on their way to fix it themselves with concrete. And a note from the Chartwell board saying they fixed it. Hmmm…. No telling. That’s awesome news that people in the community care enough. That’s what it is all about… Rising above hate. Unfortunately A sidewalk fix can’t erase racism because it’s in a person’s heart. It may be fixed but sad a person might feel that in their heart. Unbelievable is all I have to say! I saw your original post on Nextdoor when the graffiti was first discovered and assumed since the post was taken down so quickly that the neighborhood was “on it” and having the side walk fixed. I guess I am naive to assume this is a priority to be taken care of…I mean there are more important things like tennis awnings! I am glad I don’t have to walk past it! Why did they take the post down off of Nextdoor app? I’m proud of you… I wrote you a note earlier but not sure if you got it. I have tweeted this message and will be sure to do my part. It breaks my heart that only a few people seem upset or concerned.